Surface Curls Smoothing Cream is the newest addition to the Surface Curls Line. Surface Curls is a gluten, sulfate and paraben free, vegan line that soothes brittle, frizzy curls on contact through certified organic botanicals. Rich in Magnesium, Vitamin K, Cocoa Butter and Omega 3 and 6 Fatty Acids, the products restore health to all curl textures and hair types. It is an affordable luxury for all curly hair types. The new Surface Curls Smoothing Cream creates silky, smooth, straight hair while reducing styling time. The secret behind the product’s smoothing properties is glycoproteins derived from sugar cane that bind hair’s cuticle to the cortex, which reduces volume by up to 50 percent and creates shine. The product also contains Vitamin K from Cocoa Butter to strengthen hair’s structural bonds and Babassu Oil to help penetrate nutrients and hydrate hair. I love the smell! It smells like candy. No joke. It has a really nice texture that makes my hair smooth and silky. This is a great product to battle frizz and keep your curls manageable. 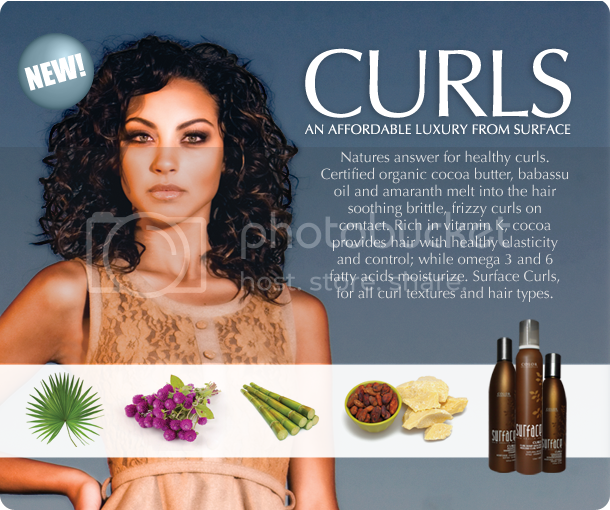 Connect :: Visit surfacehair.com to learn more about the Surface Curls Line. You can connect with Surface Hair via Facebook and Twitter. Buy It :: You can purchase Surface Curls Smoothing Cream for $26.95 at select Surface Salons.